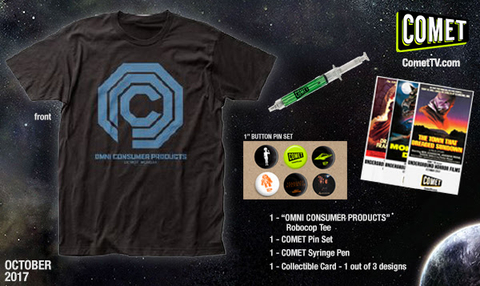 We’ve partnered with COMET TV to offer a giveaway: the October Prize Pack! One winner will receive one prize package including the items listed below (winner drawn randomly). Enter by midnight, November 3 2017 using the Rafflecopter form below (U.S. only, must 18 or over, no P.O. boxes). 1 – Robocop Omni Consumer Products T-shirt: A perfect T-shirt for out and about and to show your Robocop love. It sports the famous Omni Consumer Products logo on the front and looks amazing! 1 – Limited Edition COMET TV Card: You’ll get 1 of 3 limited edition designs that feature one of the Underground Horror Titles showing this month on COMET TV! Airing daily throughout October, check schedule HERE! Each household is only eligible to win COMET TV October Prize Pack via blog reviews and giveaways. Only one entrant per mailing address per giveaway. If you have won the same prize on another blog, you will not be eligible to win it again. Winner is subject to eligibility verification. I like the original first Robo Cop movie the best. The recent remake of ROBOCOP is my favorite film in the series. The first RoBoCop with Peter Weller. I loved it. I still watch it to this day. I felt so sorry for him. The original movie will probably always be my favorite. I like the original 1st. I like the original first RoboCop movie! I liked the first Robocop movie. My favorite is the original Robo Cop. Nothing will ever beat the original RoboCop. The original Robocop movie is my favorite. I think I’ve only seen the original, so I’ll have to say the original.